Pucker Brush Farm is pleased to offer pastured veal shares for the fall of 2017! Veal was humanely-raised on pasture with the cow and fed only milk and pasture grasses. Calf was never exposed to chemicals, antibiotics or grains. Quarter shares available, approximately 48# per share. 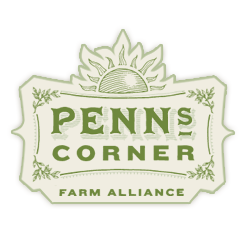 If you are interested in reserving a share please email farmstand@pennscorner.com. Pastured Veal Shares are available by the quarter and are $10.41/lb. A $200 deposit is required to reserve your share and can be paid by check or credit card. Please note: All meat is vacuum-wrapped and boxed. Your share will be available for pick up at Penn’s Corner Farm Alliance warehouse in Upper Lawrenceville, 150 54th Street, Pittsburgh, PA 15201. Shares will be available to pick up in late October.